Bastia defender Alexandre Song has joined Arsenal on a one-year loan deal. The two clubs have also agreed a fee of £2.75m if Arsenal decide to sign him on a permanent basis next summer. 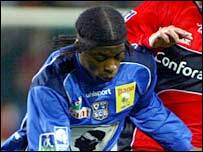 Song, who is the nephew of former Liverpool player Rigobert Song, made 34 appearances last season after signing his first professional deal. The Cameroon-born 17-year-old, who can also play in midfield, impressed manager Arsene Wenger during Arsenal's pre-season training camp in Austria. Song had been linked with Manchester United, Chelsea and Inter Milan.